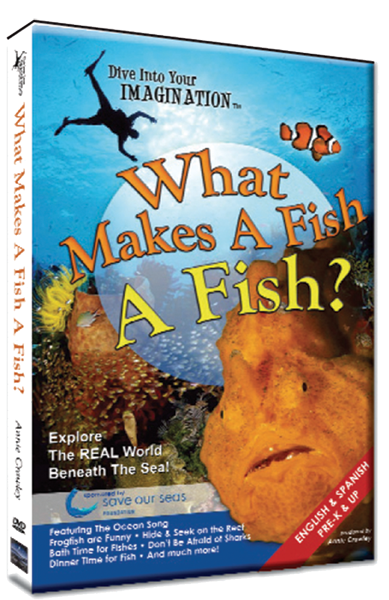 This is the 3rd DVD in a series, including "What Makes a Fish, a Fish?" and "Who Lives in the Sea?" This DVD series and the coordinating teacher's guide are wonderful for the preschool and kindergarten ages. Check out a sample clip from the DVD. Here is one more sample. This one is from the DVD, Who Lives in the Sea. Did you watch it? Wasn't it just adorable? Other educational books and DVDs are available on Ms. Crawley's website. She also has a neat collection of inspirational cards and posters, in her Live Your Dreams Collection. 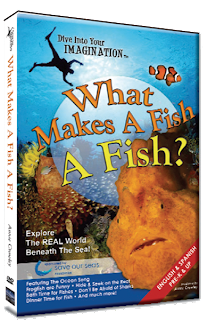 What Makes A Fish, A Fish is the first DVD in the Dive Into Your Imagination series. 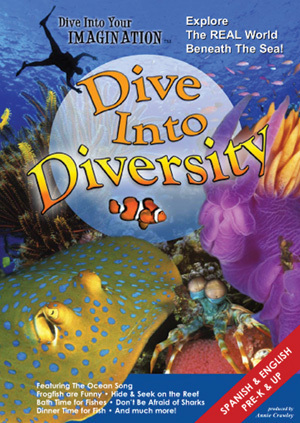 This DVD teaches children about astounding fish from around the world. How do fish take a bath? Learn the truth about sharks. Play hide and seek on the reef. The underwater realm provides boundless opportunities for parents to learn and laugh with their children. An upbeat original score celebrates the ocean and brings it to life. The DVD has three audio tracks, English, Spanish and music only. Great as an entertaining teaching tool for the classroom too! 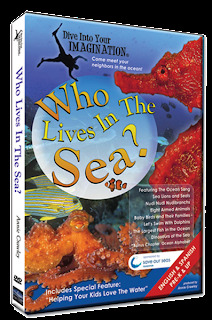 The Award Winning “Who Lives In the Sea?” teaches children and their parents about animals living in the ocean. Why do dolphins move so fast? What kind of noise does a sea lion make? Did you know turtles walked with the dinosaurs? Meet whale sharks, octopus and blue-footed booby birds! 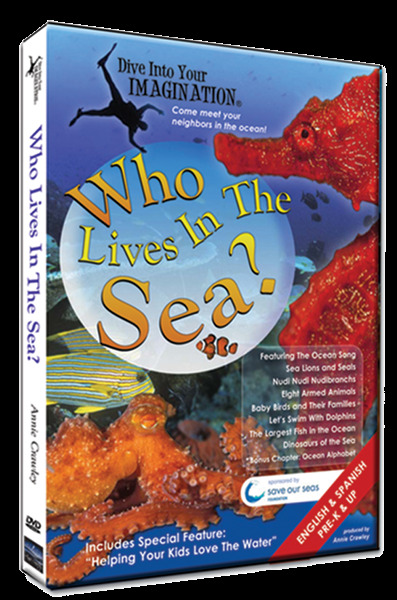 After your kids watch this DVD, they will want to swim like a dolphin and laugh at the nudi, nudi, nudibranchs! "Dive Into Diversity” teaches children about all the variety of life under the sea and how animals rely upon one another for survival. Take a ride to a depth of 1500 feet in the deep sea with a submarine pilot! Find out what happens on the reef at NIGHT. Learn what eating ice cream and brushing your teeth have in common. Transcripts of all 3 DVDs are available for purchase, for use in the classroom. The transcripts are also included in the teacher's guide. Annie Crawley and Michele Hoffman Trotter have also developed educator guides to go along with each of the DVDs. 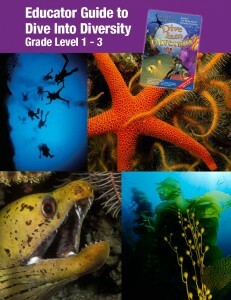 "Who Lives in the Sea Educator Guides are available in two age-group versions. Each educator guide covers eight chapters with 6-7 activity stations per chapter aligned with common core and next generation standards." These are great for the homeschool and for the classroom. I received this DVD and the coordinating Educator Guide to use with my 3-year-old daughter. She loves animals and is fascinated with our own fish. So it was just expected that she would enjoy this movie, Dive into Diversity. And enjoy it, she did. Beautiful videography of beautiful ocean scenery and marine life. It is enjoyable and educational. This isn't just for the younger set. The whole family will enjoy it. I like the narration. The music is low and soothing and the speaker's voice is pleasant. This is important to me. Because, in the past, I have listened to other DVDs where I didn't find the speaker's voice pleasant and it made it difficult for me to focus and listen. The DVD has an option to turn off voice and only play music. This could be perfect for wind-down time before naptime or bedtime. 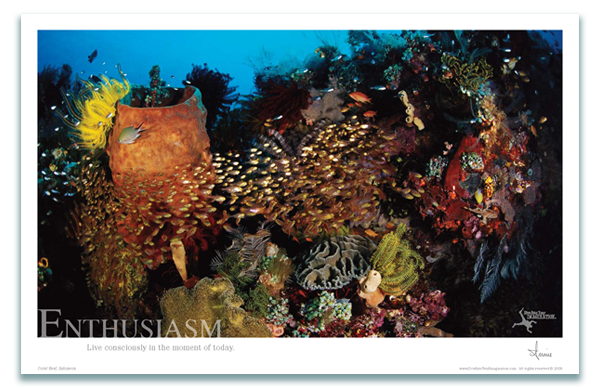 Your little one could watch the delightful marine life swim around, while listening to the calming music. Ms. Crawley and Ms. Trotter must have spent hours and hours working on the coordinating educational guides. These things are HUGE. And they are available in 2 levels. One for the PreK-K set and one for the early elementary ages. I focused on the PreK, since it was for my 3 year old. 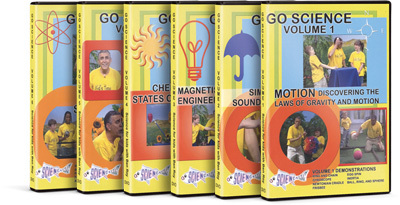 The guides are broken up by chapters, based on the DVD. They include nice printable activities and coloring sheets. They have lots of interactive group activity ideas, like acting out different kinds of fish - lots of make-believe ideas that preschoolers will enjoy. The guides also include vocabulary lists for each chapter. I, personally, thought the word lists seemed very advance for the age group. But it could be useful in a homeschool family, where you might be doing a unit study to a variety of ages. It also provides a list of recommended reading. This is great for making the lesson into a unit study. There is enough in here to spend days diving into each chapter. If you believe in Creation, not evolution - you might notice a few instances that refer to or insinuate evolution, but they are few. I also felt the guides had a little bit of a "Mother Earth" tone to it, but this wouldn't stop me from using the guides. The instructor guides are priced for use in the public school setting. It would probably not be practical for too many homeschool families to purchase them at retail price. But, for a limited time Ocean Annie has graciously offered to gift the guides to homeschoolers with the purchase of the DVD. That's right! For just the $19.95 price, you get not only the DVD but also the instructor guide that goes with it. 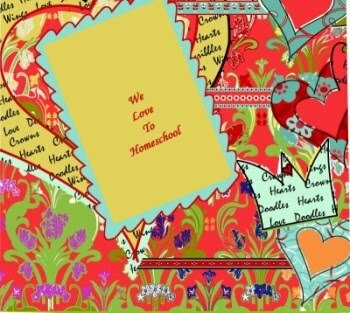 Just make sure to leave a note in the comments section when you place your order, stating that you are a homeschooler and you would like the free guides that were mentioned on the TOS Homeschool Crew reviews. Also for a limited time, Ocean Annie is offering free shipping as well. Isn't that wonderful? I think that is an amazing deal and if you are able to order it, I highly recommend that you do. The DVD itself is worth the price and something that many children will enjoy watching again and again. The guides are a bonus! If your family enjoys the Discovery Channel or National Geographic documentaries, as mine do, then this DVD should be a hit. Don't forget that there are 2 other DVDs in the series and the same sale applies to them as well. I just want to add one more thought. Annie Crawley, also known as Ocean Annie, has poured her heart into these products, as well as the other ones available on her site. She also does motivational speaking. Her message is two-fold. First, she wants to share her love of the ocean with children. She wants them to see the beauty that she sees and she wants them to realize just how vital it is that we take good care of it. "I want everyone to understand the importance of the ocean. It creates about 70% of the oxygen our planet needs for survival, " says Annie. Second, she wants to encourage children to "dive into their imagination and create the future they want to live." She shares her story of how she followed her heart and found her way to her dream job on her website. As the 2011-2012 Crew year comes to a close, we are once again presenting awards to our vendors. 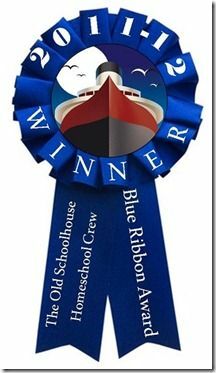 The awards are known as the TOS Homeschool Crew Blue Ribbon Awards. The following vendors are the recipients of the award this year. Click on their name to check out the Crew reviews! 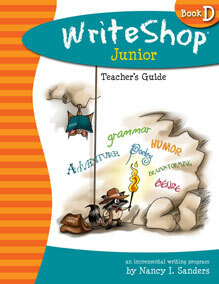 WriteShop Junior Book D is intended for 3rd, 4th, or reluctant 5th grade students. Other grade levels are available. Meet the authors of this great series. WriteShop Junior is a creative writing program that appeals to many learning styles. As with all WriteShop products, Book D helps you guide children through the steps of the writing process. To keep the experience fun for everyone, each lesson includes engaging games and activities that teach and review important writing and self-editing skills. And whether you have a more advanced child or one who is fairly new to writing, this program is flexible so children can work at their own level. Book D teaches the basics: how to come up with ideas; brainstorm and organize before writing; choose more interesting words; learn to self-edit in a fun and positive way; and publish creatively. Check out Lesson 4 to get a really good feel for the program! Want an idea of how much time to plan for each lesson? Creative writing is something that our homeschool could use more of. We work on the grammar and the spelling, but writing sometimes gets left on the sideline. So, I was eager to try this program out with my 10 year old daughter. The Teacher's Guide is very user friendly. It provides detailed schedules, lesson plans, and conversation starters. Here is the website's detailed course listing, to give you an idea of what to expect. Soft-cover book with plastic-coil binding. Lies flat for ease of use. 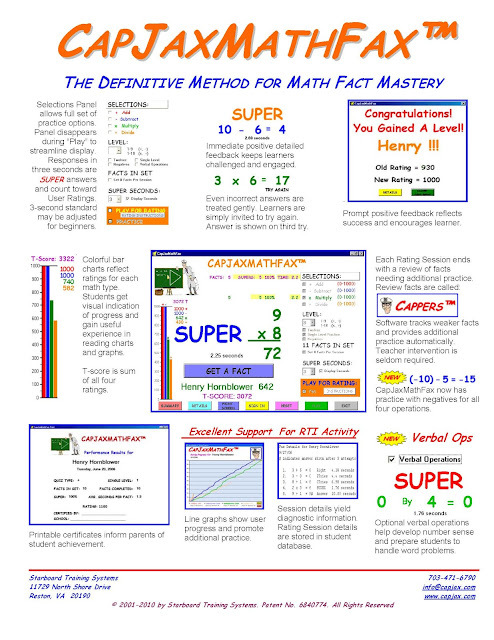 Includes several schedules with daily lesson plans. Schedules are flexible and easy to follow. Not an independent course. Lessons designed for parent and child to work together. 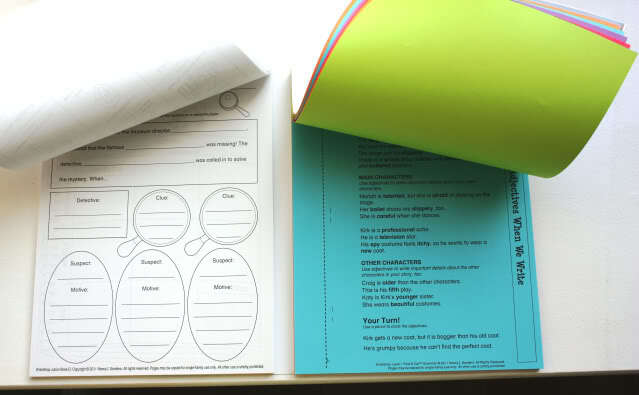 Your student will need an Activity Pack You can pick book form or eBook format. 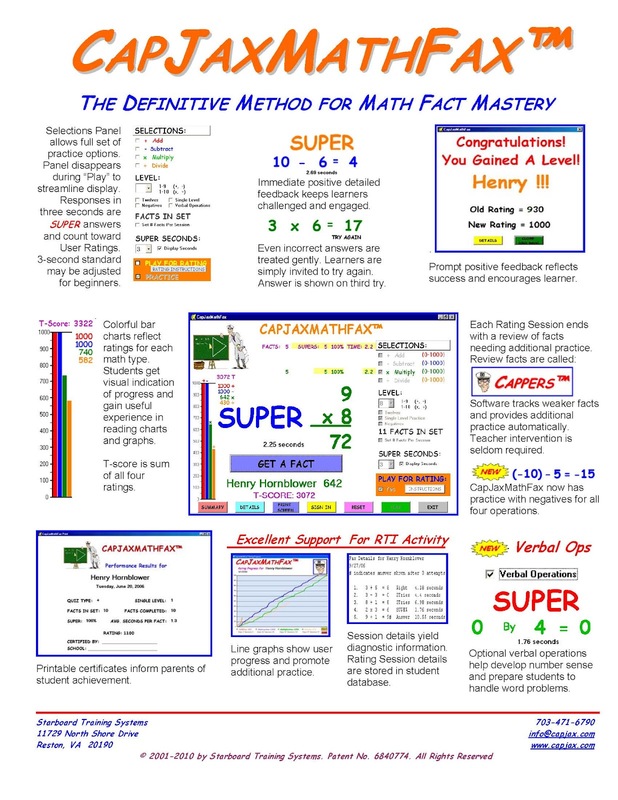 It includes the Student Worksheets that your student will use with his/her lessons. These includes activities such as reading logs, brainstorming forms, evaluation charts, etc. 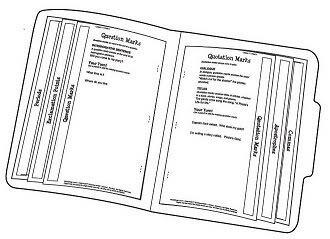 Grammar Guide inserted into folder for quick reference. The company sells an optional Time-Saver Pack, which was included for my review purposes. The Teacher's Edition includes instructions for games and activities to help boost your child's learning experience. You may choose to follow these instructions and make them on your own. But for $13.95, you can purchase the Time-Saver Pack. You will have the games and activities ready when you are. I think this pack is well worth the $13.95. I know I appreciated having it. We have been using this program for a couple of weeks now. I am impressed with Write Shop. There are so many things that I love about the program. I plan to buy the Write Shop 1 set for my other daughter to use next year. What better recommendation could I give than to tell you I plan to buy it myself next year (in a different level)? 1. The schedule is very do-able. You can choose to do one lesson in 2 weeks or 3 weeks, depending on which works best for your homeschool and student. 2. A variety of activities work with different learning styles. My 10 year old has enjoyed them and it has helped things "click" for her. 3. The Fold-n-Go Grammar Packs are great little reference packs. 4. Writing topics are "general", not "specific", giving my daughter a great deal of freedom in her stories. 5. The idea of a "sloppy-copy" has freed my daughter up to write without worry in her first draft. 6. The Teacher's Manual is very detailed and user-friendly. All the work has been done for me. 7. The tear-out pages of the Activity Book. 8. The time-saver pack, because it really is a time saver. I like this program. It is creative and thorough and fun. And it works! I have been delighted to watch my daughter's creative side flourish. If you prefer to use the eBook version, here is a tutorial about using it on an I-Pad. Take 15% off any WriteShop Primary and Junior products in the WriteShop store (including e-books) using coupon code CREW15 at checkout. Offer valid through June 15, 2012. Read more reviews from the TOS Crew. Many other great items are available at Library & Educational Services, such as Adventures in Odyssey and Focus on the Family. Library and Educational Services offers "great quality at great prices". It is the perfect place for homeschoolers on a budget to find just the right the right item at just the right price. 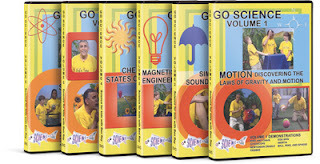 Library & Educational Services asked us to review 2 of the Go Science DVDs. 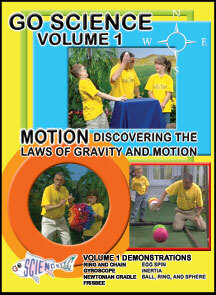 I chose "Volume 1, Motion - Discovering the Laws of Gravity and Motion" . . . and . 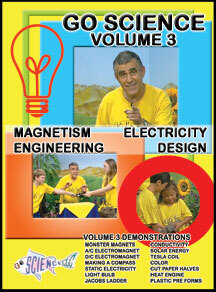 . ."Volume 3, Magnetism, Electricity, Engineering, and Design". "These episodes were originally produced for a religious television show (WTVC Newschannel 9 Science Theater). Even kids who claim an aversion to science will be engaged by the high-energy science demonstrations of Ben Roy! Ben teaches science methods at the University of Tennessee at Chattanooga and is the former director of a science program on television. With this expertise, Ben captivates, motivates, and inspires students to be excited about science, while providing effective instruction based on science phenomena. Each spectacular demonstration of physical or chemical science has a spiritual application and points to our Creator! More information about Ben Roy can be found on his website www.gosciencezone.com and Facebook." When it comes to science and history, I prefer not to use textbooks, when at all possible. I like to use living books, biographies, documentaries, museums, etc. A DVD full of science experiments is a great fit for our learning style. The experiments on these videos were originally produced to be aired one at a time on television; the experiments range from 3 to 6 minutes. Ben Roy has an obvious love of God and science and enjoys sharing both with children. The videos are filmed with a live audience of children of varying ages. Children are called up to help with the experiments and observations. Ben energetically shares a science lesson and then connects it back to God. He ends each segment with the motto, " Every time we learn something about SCIENCE, we learn something about our CREATOR GOD!" Some experiments can be repeated at home. Others cannot. Regardless, your child can enjoy and learn from the presented scientific principles just from observing Mr. Roy's lessons. It will peak interest. It is up to you what you choose to do with it. Whether finding related experiments to try at home, watching further documentaries about the topic, checking out books on the subject at the library. View these videos as a springboard to get the discussion started; it is up to you where you jump off. I appreciated that these videos were filmed with a Christian perspective. It is difficult to find science videos that aren't peppered with references to evolution and old-age theories. This is important to my homeschool. Although it is unavoidable at times, it is always a welcomed relief, when it isn't an issue. Science is about God's creation; I appreciate Ben Roy giving God the credit and glory. I will say that I think the recommended age range is high. The topics will be of interest to a 14 year old. But more than likely, a 14 year old will find the host's presentation too "kiddie-ish" for their tastes. Ben Roy is very peppy and energetic and basically talks like I would talk to my preschooler through the whole lesson. Granted, he is trying to show just how exciting science can be. But the set-up and excitement level made me think of the classic "Howdy-Doody" show. This learning style works great if your children are in the early elementary years. But you may get some eye-rolling if your kids are past that age. Watch the sample video to get a feel for it. My 13 and 10 year old daughters did find the topics and experiments of interest; I did as well. But they felt the show was too "kiddie-ish" for their tastes. My 3 year old daughter enjoyed it and I'm sure she would for several more years. I would recommend the DVDs for up to about age 8 or 9. Do you homeschool? Do you love books? Would you like to expand your home library? Maybe you have been searching for a classic or hard-to-find book. Julie Huffman and Gayla Weatherford have the answer for you. The answer is Homeschool Library Builder. The name of the company really says it all. If you would like to "fill your bookshelves without emptying your wallet", this is a good place to start. Trying to get a bargain on the living books you need for your curriculum? HSLB allows you to search by curriculum for Beautiful Feet, Five in a Row, and others. Maybe you are studying the Arctic Ocean. HSLB lets you search by region. This search feature is very helpful and time efficient. Books are sorted by age, vintage, holidays, science, etc. Maybe you aren't even looking for a certain title, just a certain topic. This is yet another way that the search features come in handy. Stop right now and go sign up to start receiving their newsletter. You will be "in the know" when HSLB has some of their great sales and specials. For example, for the month of May, all items are 25%. This is on top of the already great prices. Sometimes they have "bargain bins" with items as low as $1. HSLB also has a some cool member benefits, including the Book Points Membership Rewards Program and the Share the Savings Program. Both are great ways to earn points towards $$ off your purchases. 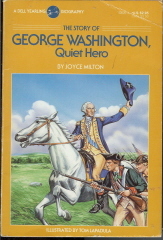 As an example of their great prices, here is a book about George Washington for only $0.99. Since limited quantities are available, they may sell without notice. And as a reminder for the month of May, all items are 25% off. That is 25% off of their already low prices. 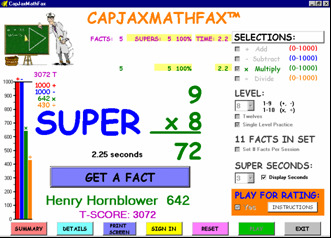 Disclaimer: I was asked to review this website as part of the TOS Homeschool Crew. No compensation was received. The above is just my opinion. Please remember that opinions may, and do, vary.